Stanley Kubrick's Full Metal Jacket is an unusual Vietnam war movie. It doesn't have the raw, gut wrenching emotion of Platoon, and though it is somewhat bizarre, it doesn't have the full psychological horror trippy-ness of Apocalypse Now. It is, in typical Kubrick fashion, a film that is hard to access, hard to connect with. It is distant, austere and odd. In some ways, it doesn't seem an authentic portrayal of war. The first part of the film documents the rigors of basic training and seems far more real than the scenes that take place in Vietnam. Those are the scenes I want to examine anyway as they are all about the creation of a specific masculine identity. There is a strange doubling (a theme Kubrick loves) attendant in basic training in that "the military [tries] to create a military form of masculinity, but masculinity has already inflected the creation of the institution of the military in the first place, as well as the desire to propagate that genre of masculinity." It's difficult to tell where masculinity begins and ends in this situation. In a way, men go off to military bases to become what they already know, to become what is so familiar to them from images of military men in movies and books. Private Pyle is not enjoying basic training. The opening of the film starts with the standard procedure for new recruits--getting the regulation haircut. The camera zooms in on the faces of the men, they look serious; some frown, some look angry, others are nervous. This is a rite of passage, an entry into military life. 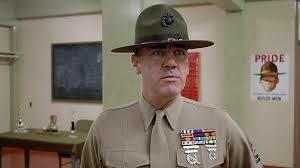 What follows is the systematic erasure of identity beginning with the nicknames that Sgt Hartman (R. Lee Ermey) gives the privates. He doesn't allow them to select a name for themselves, rather he chooses names that are somewhat degrading, yet also reflective of each individual's physical or emotional characteristics. He also beats and punches the men who don't perform as he would like. One man, nicknamed Pvt. 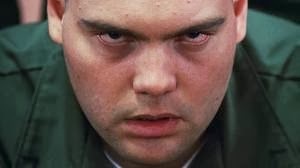 Pyle (Vincent D'Onofrio) bears the brunt of Hartman's anger. Pyle is slightly overweight and slow to learn which causes problems for the rest of the privates once Hartman decides that they will be punished for every mistake Pyle makes. Stress levels in this situation are high. Basic training is tough, there are obstacles to overcome (actual towering wooden contraptions that poor Private Pyle can't navigate). At the same time, Hartman is trying to merge man and gun through endless drill marching that features cadence calls in which the soldiers sing about their rifles while grabbing their crotches. Later, the rifle becomes a girlfriend to the men, when Hartman demands they give their rifles a girl's name and sleep with them in their bunks. All this activity is supposed to make these men into soldiers- to make them forget who they used to be. Indeed, Pyle gets in a lot of trouble when he makes a mistake during a march. Hartman immediately accuses him of trying to be "different." To become a soldier, difference and individuality must be eliminated. There is very little freedom in the soldier's identity- especially during the time of the draft when half the men serving weren't there because they wanted to be, but rather because they were forced. All this training does make some of the privates into good soldiers and it drives others insane. Kubrick seems to be saying something about the fragile nature of masculinity-- attempt to create it with too much force and violence and it will self-destruct. Reeser, Todd W., Masculinities in Theory.